All of the Japanese carriers have followed Docomo's lead and introduced new plans with unlimited calling and shared data. A comment on a previous post pointed out that this adds more complexity to the typical Japanese carrier strategy of throwing cash and discounts at people to induce them to switch because of increased minimum monthly costs. To be honest, this year's iPhone release was really boring. I was hoping to see some whacky promotions, but they just never happened, perhaps because the Ministry of Internal Affairs and Communications asked the carriers show a bit of restraint. The above prices are without tax. I haven't bothered to separate by carrier because they all charge the exact same price. The only difference is in Docomo's old voice plan (shown in parenthesis), but that's only a minor point because it doesn't exist anymore. The difference in price between the old and new plans is ¥1,566, which equates to about 40 minutes of outgoing calls (at ¥20/30 seconds). Note that the old plan as shown doesn't include any free outgoing calls, even to users of the same network. For someone who makes zero outgoing calls, that's an increase in price of ¥37,584 over a 24-month contract. However this is only the case if you are getting your shiny new iPhone from Docomo. Not only had docomo discontinued the old data plan as of September 1st of this year, existing customers MUST upgrade to the new data plans to be eligible for a monthly handset subsidy (月々サポート). There is no mention of the voice plan, but (as you may have guessed), getting the new data plan also requires getting the new voice plan. Yay. The monthly subsidies are what allow you to walk out of a store with a new phone for somewhere between nothing and ¥20,000. The actual cost of the phone is often upwards of ¥100,000, split over your monthly bill for 12 to 24 months. Then the subsidy (typically an equal amount) is subtracted. Remove that subsidy and you will be charged ¥99,792 for a Docomo iPhone 6 Plus. Unlike docomo where the only reasonable choice is a new data plan, both AU and Softbank offer the old plans, even for new new users who port over a phone number. 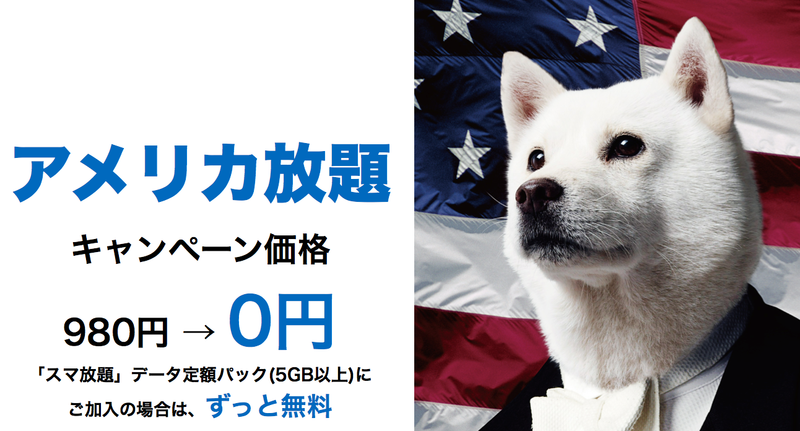 The Softbank white plan is available for new contracts until November 30, 2014. The AU LTE Plan was previously shown to be available until the end of February next year, but there is currently no restriction displayed. When porting in a new new number (MNP) to either KDDI or Softbank, the old plan base fee (¥934) is waived for two years. These two carriers will also buy back your old docomo iPhone 5S or 5C for about ¥30,000 or so. I'll consider a 1 year old 16GB Docomo iPhone 5S that was bought by an existing customer (no MNP discount). In that case, you probably owe about ¥40,000 on the phone, which is the amount you will be billed for if you cancel you contract and port out your number. Add to that about ¥10,000 for early termination, and the cost to leave Docomo becomes ¥50,000. KDDI will buy that phone for up to ¥31,000, and the waived base fee (old plan) totals about ¥22,000 over 24 months, offsetting the cost of leaving Docomo assuming you don't then jump to Softbank when the new (and probably shiny) iPhone 6S Plus XL is released next year. 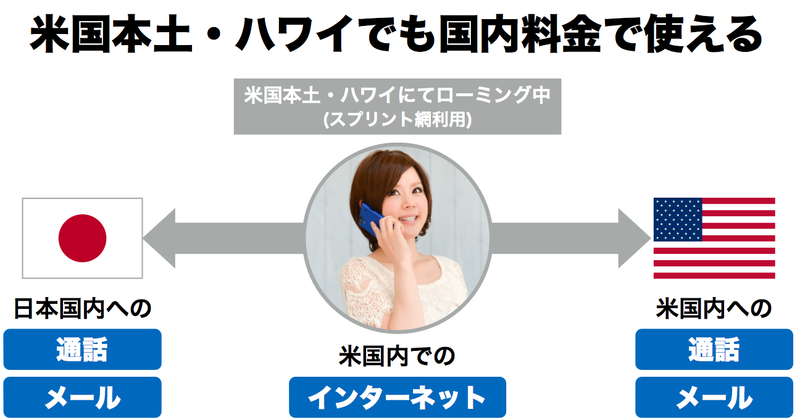 If you stay with Docomo, while they will buy back your iPhone 5S, they won't give you a discount for being a loyal customer, and they will force you to upgrade to the unlimited calling plan, a roughly ¥2,000 monthly increase over the current least expensive voice plan (an additional ¥37,584 over a 24-month contract). Updated with a correction on application requirements and some images. Free calls to both Japan and the United States using Sprint's network. No service application or service fee for plans over 5 GB. I was planning on writing up a post comparing each of the Japanese carrier's iPhone 6 plans but that really gets tiring. They are all basically the same. As soon as one carrier outdoes the rest with some promotion, campaign, discount, offer, or other gimmick, the others quickly devising a similar scheme. The discounts and cash back offered to people who port their number to a new carrier offset the early termination fee for leaving. The new plans allow unlimited calling to all mobiles/land lines, so it no longer matters which carrier your friends and family use. All carriers now have similar coverage across multiple high and low frequency bands. All carriers now have similar issues with congestions and network slow downs. However, this year is different. For American expats or people who frequently travel to the United States, SoftBank appears to be the clear winner in the iPhone 6 competition. After purchasing a majority stake in US carrier Sprint, SoftBank is now able to offer deals that Docomo and KDDI simply cannot match. The full details are still scarce, but unless there is something profound that is being held back, the new US roaming plan from Softbank looks pretty nice. ¥980 per month only during months the service is used (free during the initial promotion period and). To do this requires the usage four separate technologies across multiple spectrum bands. SoftBank is a WCDMA carrier, but Sprint (like KDDI) is a CDMA-2000 carrier. While in Japan, the iPhone 6 would use SoftBank's WCDMA (1), FDD-LTE (2), and TD-LTE (3) networks. While in the US, it will use Sprint's CDMA-2000 (4) network, and (eventually), also their TD-LTE network. While some earlier iPhone models are technically compatible with Sprint, these will be excluded (presumably) because they are locked to the technology of the activation carrier. That is, an iPhone 5 activated on a WCDMA carrier can only ever be used with other WCDMA carriers. I guess that could be patched, but then that would remove the inducement to buy a new phone. There are currently no other phones except for the iPhone 6 that support this combination of bands and technologies. SoftBank is considering releasing an Android phone that would also be compatible. An unlocked iPhone 6 will be ineligible for the all-you-can-america plan. It is also possible to expand usage to FDD-LTE bands 25 and 26 that Sprint is building out. The TD-LTE network that will provide the 4G data connection in the US was originally built out by Clearwire. Sprint at one point owned just over a 50% stake in Clearwire before scaling back to just under 50% in around 2011. Then after SoftBank CEO Son took control of Sprint and injected lots of cash, Sprint bought all the remaining Clearwire shares, obtaining a lot of spectrum and, by chance, a TD-LTE network, using the exact same frequency band (TD-LTE band 41, 2500 MHz) as SoftBank. Makes me wonder how much that network figured into the decision. FeliCa is Sony developed "Japanese NFC" and is much older than the international NFC system that was inspired by it. Early Japanese phones (smartphone and feature phones) were FeliCa only; newer (all 2014 models and most 2013 models) Japanese market Android docomo phones with NFC are hybrid NFC+FeliCa. 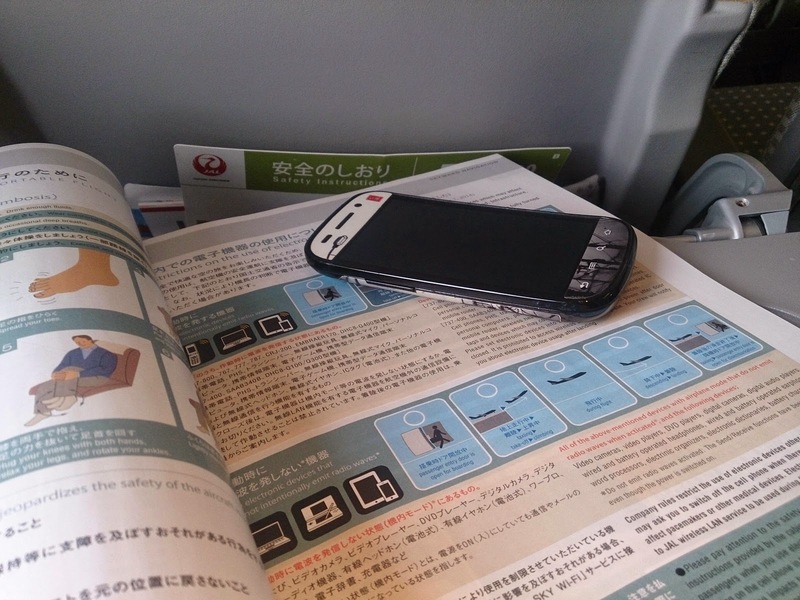 Non-Japanese phones are NFC only. 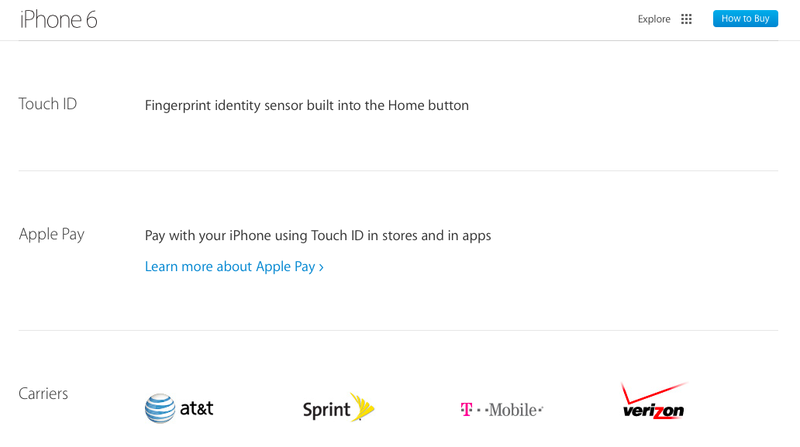 The tech specs so far only list NFC as included on the iPhone 6. Perhaps you recall the debacle surrounding the advertising for the LTE iPad, which misled many non-US consumers to think it was compatible with their local 4G networks. This time around, the marketing department at Apple has done a much better job. There is simply no mention of "Apple Pay" at all on the Japanese website. Well, I wrote a nice post with the crappy blogger android app, but all the text disappeared, so I'll just leave you with this photo.